The vignette of Mrs. Balodimou, revived in my memory the bitter experience I had a week earlier. In the evening of Holy Thursday, when going to the Stavropegic Church of St. Paul in Geneva for the Service of the Holy Passion, I saw posted at the entrance and courtyard of the Orthodox Center of the Ecumenical Patriarchate an advertisement for a Greek taverna, which read as follows: "Holy Saturday in a Greek Restaurant - Homemade Magiritsa - Lamb cooked on a spit with potatoes - grilled lamb chops - kokoretsi - appetizers. After 11:00 PM (i.e. during the Paschal Divine Liturgy!) Special Rates!" This is to be interpreted as follows: "Orthodox Greeks of Geneva, abandon the Church and rush to celebrate Pascha at my eatery, even though the Sacred Chrysostom invites you to 'enjoy the banquet of faith' that the Church offers at the dawn of Sunday!" This, fathers, brothers, sisters and children, at the outer gates of a church! The pinnacle of shamefulness and disrespect! You might say - to what is the scandal? The initiative of the restaurant is not blameworthy! The man did what every restaurant and taverna in Orthodox Greece does! H simply exported to International Geneva an "Orthodox Tradition" in order for the heretics, heterodox and heteroreligious to see what a "Greek Easter" means! When one sees the way in which Pascha is celebrated today in the land of Greece, it leaves one to wonder: how did the once devout and pious Greeks turn this eminent Feast of the Orthodox East, which is "the celebration of celebrations blessing Christ unto to the ages" (Eirmos of the 7th Ode of the Resurrection Matins), into an irreverent folk "festival"? What happened that, with time, the Greeks have lost their Orthodox identity? They who on the day of their baptism were given the "Seal of the Gift of the Holy Spirit" and not those who received from Police Authorites! How did they lose their well-known divine reverence? How, and why, did they abandon their source towards Ecclesiastical love and devotion? What are the factors that contributed to the gradual desertion of the mass of Greeks from their Church? Was it Masonry? Zionism? Theosophy? Ecumenism? Perhaps it is the "multitude of politico-religious organizations" that have led contemporary Greeks to go out to tavernas on Good Friday after the procession with the Epitaphios, throwing themselves into food and drink, allegedly "blessed" by Christ who was just entombed? Perhaps the "heresiarch" Pope urged the neo-Greeks to confuse the "Arise O God" of Holy Saturday with the "Christ is Risen" on the "first of the Sabbaths" (i.e. the Sunday of Pascha), and announce pompously from the radio and television midday on Saturday that "that First Resurrection has taken place!"? As if the Lord has resurrected twice from the dead in twelve hours! Perhaps the Ecumenists catechized the Orthodox Greeks to disperse "like fading smoke" and disappear "as wax melts before a fire" once "Christ is Risen!" is heard, totally disregarding what will follow soon after this cheerful message, leaving the liturgists, chanters and few faithful alone and deserted to celebrate the Paschal Divine Liturgy? Some would say, perhaps, that this is the "Greek Easter"! But is it the "Pascha of the Lord"? That is the question. How will you respond respected fathers, beloved brethren and co-liturgists to this question? Especially those who for a long time with encyclicals, homilies, and writings strongly fight for the strict observance of Orthodox Tradition and protecting our blameless Faith from the maltreatment of heresies and the storm of the "Panheresy of Ecumenism"? 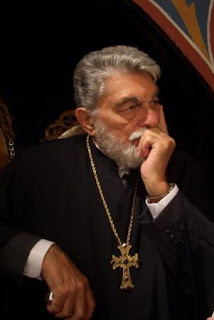 Do you not think that the time has come to articulate some theological and pastoral words, and to inspect the heresies against God of the divine behaviors of "Orthodox" Greeks who taunt Christ who was crucified, suffered, entombed and Risen, and have turned the Mysteries of the Church into a simple social event? Fathers and brethren, Christ is Risen! As the Sacred Chrysostom proclaims in his Catechetical Homily: "Christ is Risen and the demons are fallen!" Do not forget, however, that demons do not only lurk in the "heretical West". They also exist in our East. And even in our Orthodox Greece!